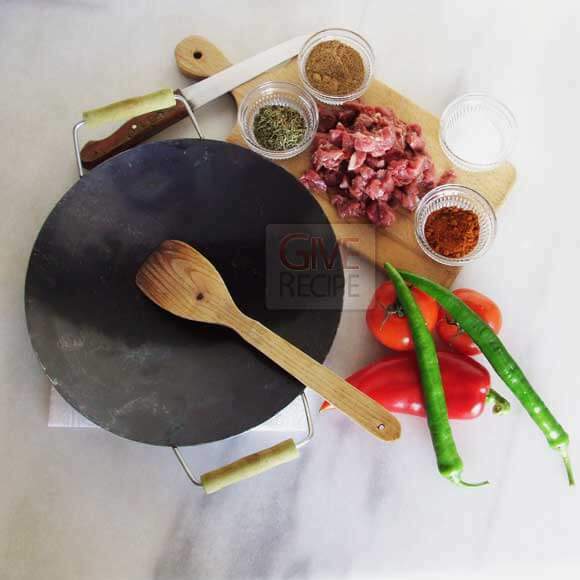 Iron plate, which is very thin, is the most preferred kitchenware in Turkish cuisine to cook lamb or beef. It even gives its name to a certain dish. 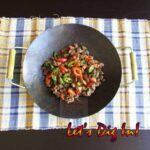 On a resturant menu, you can see a dish called ‘sauteed beef in iron plate’.The best way to use iron plate is over wooden fire, but if you don’t have that opportunity, you can still use it in your kitchen over your regular stove. 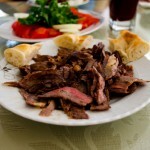 Iron plate means sac in Turkish, so the dish in Turkish is sac kavurma. 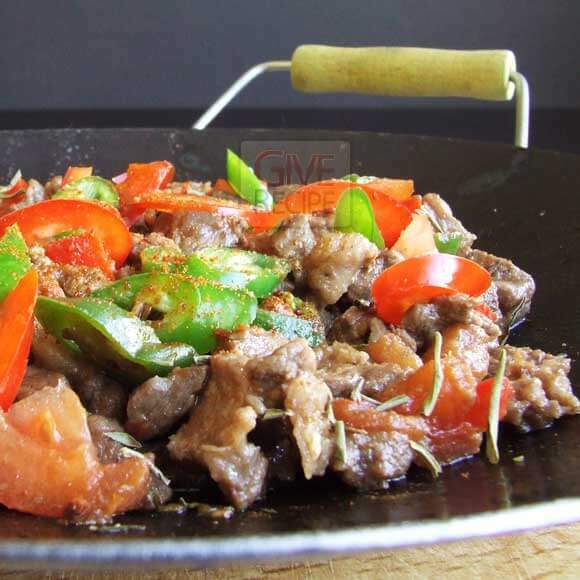 Iron plate is not used only for cooking, but it is also used to serve the dish. 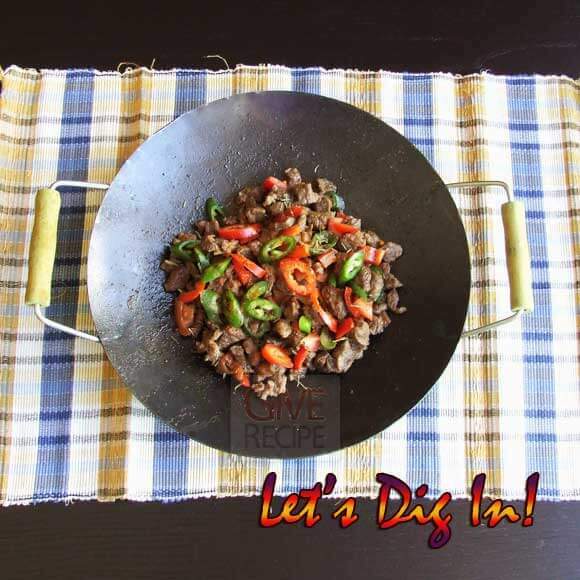 You should be careful when enjoying your food as it is still sizzling and the iron plate is still hot. You can find iron plates in different sizes. Besides ordering individual portions, in some restaurants you can order your beef in iron plate for one, two or three people. They just bring the food in one iron plate, put it in the middle of the table and everyone eats from it. The one above is the common shape of iron plate in Turkey; it is round and has two wooden handles on both sides. Our iron plate can cook for two to four people. We cook either lamb or beef in it and both become so tasty in this way. You can use your favorite meat for this recipe. Heat your iron plate over medium heat. Pour 2 tbsp olive oil in it and add beef into it. Cook it stirring occasionally. Let it release water and absorb it back. When it starts to absorb its water, bring it to the lowest heat. When there is still a little water, add 1 tbsp olive oil and cook until tender. Toss in chopped tomatoes and peppers. Do not let them get mashed, just cook them for a few minutes until a little tender. Add salt and season with thyme, cumin and chili. Serve it hot in iron plate accompanied by shepherd’s salad. Heat your iron plate over medium heat. Pour 2 tbsp olive oil in it and add beef into it. Cook it stirring occasionally. Let it release water and absorb it back. When it starts to absorb its water, bring it to the lowest heat. This sounds delicious and I love the way it’s cooked. Unfortunately I don’t have anything similar so would have to make it in a frying pan. I’ve never heard of the iron plate before but after seeing that dish and reading the ingredients, I need to find myself one! The design is similar to a wok, but you said it’s thinner metal? The food is absolutely stunning.